Danny Williams believes AFC Fylde’s FA Trophy thrashing of Stratford Town was the perfect way to rebuild confidence. It was Fylde’s first game since throwing three points away at Dover Athletic, where they conceded twice late on to lose 2-1 against 10 men. But Williams is hoping this cup win can replenish the Coasters’ confidence after that disappointing result in the league. “It’s always tough,” he said. “They come here and it’s a bit of a cup final for them. “The conditions out there were very tough, very windy and very cold, so it was good to get the win. The Coasters, who now turn their attention to Saturday’s home clash against Ebbsfleet United in the National League, dealt with the blustery conditions well to avoid a cup upset. Matters were helped by Fylde’s early goal, which came courtesy of Serhat Tasdemir as he capitalised on a goalkeeping error. Loanee Williams bagged his first afternoon to make it 2-0 inside 20 minutes before Fylde’s leading scorer Danny Rowe made it three. Tasdemir and Williams both netted in the second half to end the game with two goals apiece and round off the comfortable win, with Stratford bagging a late consolation. The winger added: “If you can get an early goal, then you can always go on to get two or three. “The longer they hang on to a clean sheet, the harder it can be against lesser opposition, so to speak. Williams signed for the Coasters on loan from League One outfit Accrington Stanley back in October and his deal runs out next month. 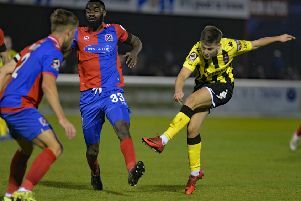 The winger, who has previously played for FC United, Kendal Town and Chester, has made only four league appearances for Fylde to date. The 30-year-old has struggled for fitness, having previously spent time on the sidelines with an ankle injury, but the experienced forward is hoping he’s now over the worst of it. “I’m enjoying it here. It’s a good group of lads,” he added. “I’ve had a little bit of an injury but my ankle is feeling a lot better than it was as.